We’re four days into this year’s Geeks Doing Good fundraiser. I hope you’ve been enjoying it as much as I have. I’ll admit that I spend a lot of this week refreshing the fundraiser page to see how much we’ve raised. 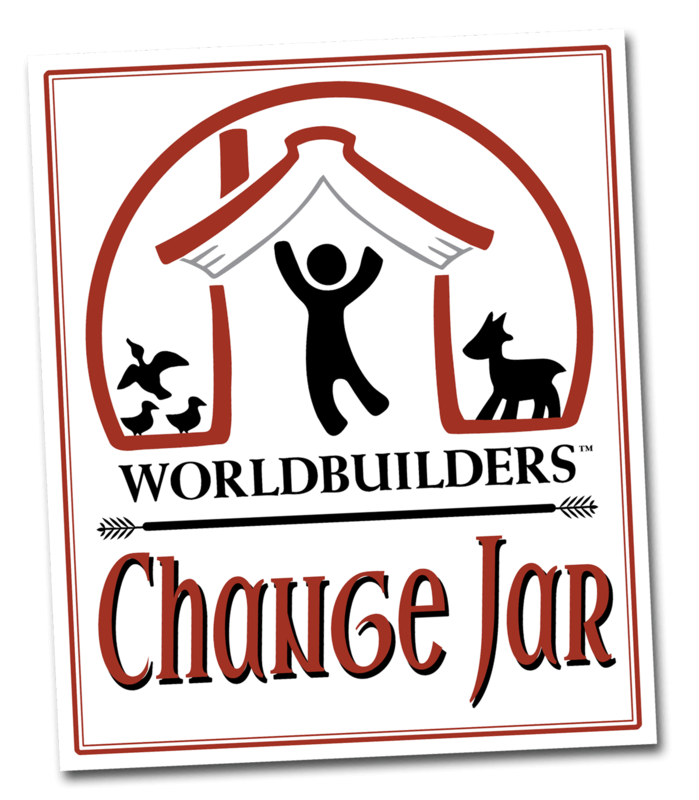 Today I’m going to talk about one of the items we’re trying out for the first time this year: Change Jars. 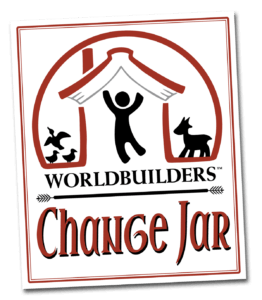 I’ve talked on the blog before about my own change jar. For the lion’s share of my life, you could tell a lot about my financial well being by the state of my change jar. If it had quarters in it, you know that I was doing pretty well for myself. But more often, those were picked out for laundry, or even to pay for food. During the leaner times there weren’t many dimes in there either…. So these days, when I look at my change jar seeing all those quarters is a constant reminder of how well I’m doing. A couple years ago, I practiced counting with Oot, my young son, and then recorded a video with him where he really suprised me. Anyway, ever since then, the change jar in our house has been referred to as a Cow Jar. Whenever Oot would find a coin, that’s where he would put it. If someone gave him some money, he would typically put it there. The enterprising little guy even set up a store in our house, selling the candy he got for Halloween so he could get more money for the Cow Jar. After two and a half years, Oot was sure we had enough for a cow. 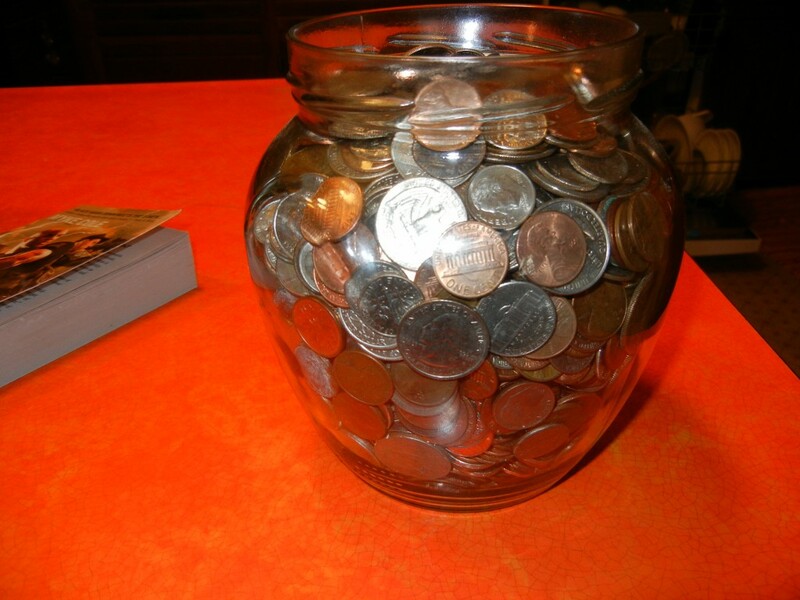 So we took my change jar, Sarah’s change jar, the change jar in my office…. pretty much all the change jars in the house, combined them, and we ended up with this video…. We didn’t end up with quite enough for a cow. And while Oot was a little disappointed, he has redoubled his efforts to save enough money for a cow by Christmas time. I was thinking about this when we were developing our product ideas for this year. Every couple days when I put my change into a bowl by the door, I smile and think about buying a cow. What’s more, I think about how much fun it will be to count out the change with my little boys. It’s a good way to sneak a little math into a project, while getting them to think about giving to people less fortunate than themselves. I thought it might be fun to share this family tradition with you. So I asked them if they could come up some change jars, for those of you who… I don’t know, really. Maybe for those of you who have kids and would like to show them that thinking about helping others can be part of your everyday life. Or maybe you’re a fan of Worldbuilders, and putting saving up for a goat will make you happy. Maybe you’re more high-class than I am, and you want something more attractive for your loose change than the cereal bowl I’m currently using. Or maybe you’d just like to join Oot in his quest to gather change and make the world a better place. I think we might have a “Oot’s Change Jar” team this year during our holiday fundraiser, where everyone who has been saving their pocket change can join forces and be awesome together. And here’s some jars you can use if you want to do it with some style…. A smaller jar that fits around $20. Enough for a flock of chicks. That means eggs for eating and selling every day. To say nothing of the fact that chickens themselves improve crop yields, as they eat bugs that cause problems in gardens and small farms. There’s a medium sized jar that should hold $60 for some tree seedlings. Trees can provide fruit and nuts that a family can eat or sell to gain financial security. Trees also provide shade, and greatly improve sustainable agriculture by preventing soil erosion. 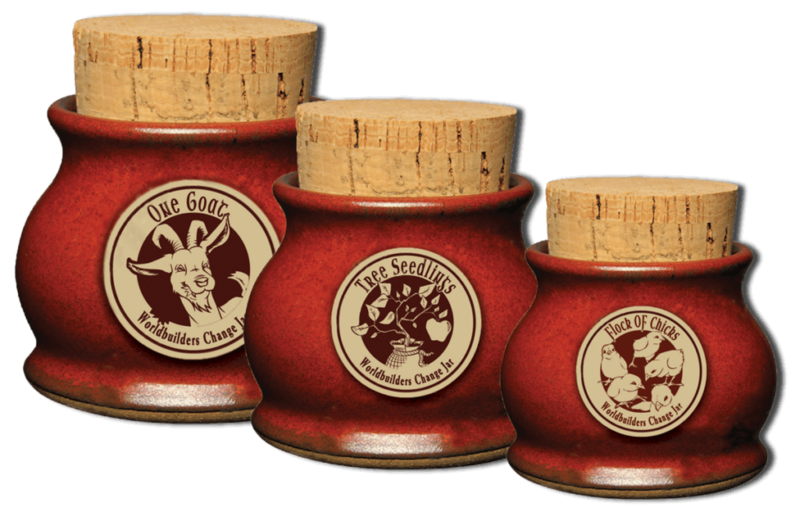 There’s also a large jar that hold enough for a goat: $120. I’m not shy about the fact that I love goats as a Heifer gift. 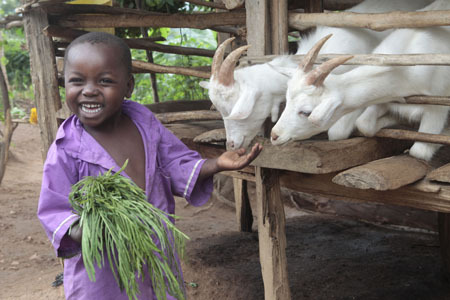 A goat can easily produce more than a gallon of milk a day, enough to supply a family with some left over to sell. They’re known for having twins when they give birth, so the families are that much better at Passing on the Gift of a baby goat to other families in need. We’ve designed a sticker to affix to your existing jars at home for those of you who would prefer more of a low-impact way. It’s just a couple bucks over at the fundraiser…. And you can also pre-order a signed copy of the 10th anniversary edition of The Name of the Wind, too. If you’re into that sort of thing. There’s also t-shirts and… well… kind of a lot of stuff. Too much to describe here. I just peeked over there and saw that the total is over $93,000 now. I’m hoping we can make it to $250,000 like we did last year. I love Oot stories! Your son is very smart. It is always a joy to watch him. This is the first year I’m able to contribute (thankfully in more than a single way) to Worldbuilders and I’m very excited about it! I’ve been wanting to help for years so this is a very special time for me and it fills my heart with delight. Let’s hope the fundraiser breaks last year’s goal!! Welcome to the team! Thanks so much for being willing to join in and help out! Correct me if I’m wrong, but isn’t Oot your older son? In the blog you said he was your youngest. Your son is so kind and sweet! My nephew was born yesterday, and if he grows up to be only half as great as Oot, I will consider myself very lucky! I agree with browncoat! Your son is an upstanding guy at such a young age! He looks very similar to this this child actor. Heh. That’s what I get for writing a blog post at 4:30 in the morning. My son is six in years of age but more in heart and mind. His nature is a calming influence in my life and I am a better person for it. I can’t but help wonder if I was as considerate and rational as he is when I was that age. I cuss, road rant, and yell at the tv when ever I see a Breaking News subscript on the same screen as a Trump tweet… I keep thinking I’m going to pass on my adult issues to him, but instead he stuns me into silence when he says things like “It will be ok daddy”, or “Your my hero” when I asked him why he said, “Because you love me”. Without a doubt, I think I am the student. You can tell we watch to much news in some of his comments. He asked us, “Can they stay with us, I’ll share my toys” in reference to refugee crisis story we were watching about a family with a child his age. Sometimes my wife and share a look that says “When did he come up with that” shocked that he is paying attention. Anyways, I run on. Carter has a 4 year old change jar and has offered it up several times, he thinks we could use it more. I think this is great idea. I’m sure he would be glad to help. I heard somewhere that the children of today will be the first to grow up with an ideal of a world community. It makes me hope. I was trying to decide between a shirt and the water bottle, and I missed the deadline! Will I be able to buy the Cthaeh shirt or the Greysdale Mead bottle on the Tinker’s packs?? I’m so disappointed! 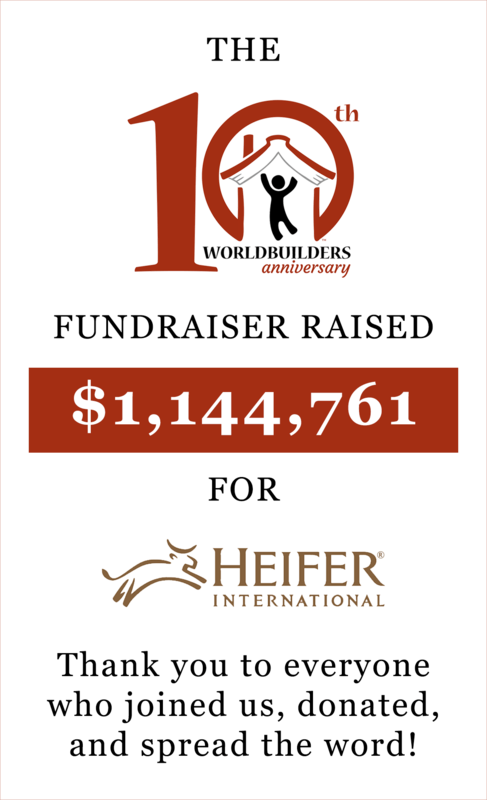 Email us at fundraiser (@) worldbuilders.org and we’ll work with you! No!! Nooooooo!!!! 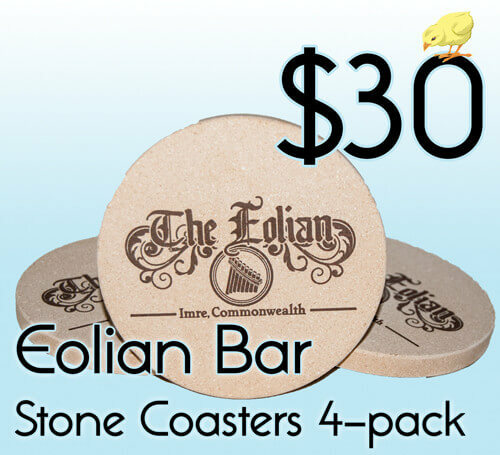 I am in despair as I only now saw the WONDERFUL Eolian coasters! I must MUST have a set – 2 sets – one each for my harp teacher and myself. Please post them for sale in Tinker’s Packs. Pllleeeease? Pat, a ghastly thing has happened. I thought I ordered two 10th anniversary books and out turns out I only ordered one, and now it’s over! The one I ordered was for a friend, but if I don’t get one I will LITERALLY demolecularize. Is there any way I can still pre-order? Thank you for sharing these stories of your children with us Pat. Oot’s compassion and selfless desire to help others gives me hope that the next generation will make the world a better place. Seeing the effort he is putting into saving change has inspired me to set up a monthly donation to Heifer, so please let him know that in that way another family will be getting a cow because of him. Sorry I missed this fundraiser. I just had to say that Oot is ADORABLE. And here are some fun facts about family cows to add to his brilliant mind…Besides producing milk and babies, cows also produce manure, which is a highly valuable resource for subsistence farmers. Its contribution to the fertility of small fields and vegetable plots may be as valuable as the milk. In some places cow manure is also used as fuel, or even as a component of mud bricks. Yes, building material from cow poo! I thought Oot might appreciate knowing these additional benefits of his charity.